In 2010, Justin St. Louis did a great piece on the history of the Governor's Cup, a race supposedly involving only stock car racing in Vermont since the sport became organized enough to conceptualize involvement by the state's highest governing figure. This blog is only an attempt to take St. Louis's wonderful work and add my two cents to it – for the benefit of those who might see my article and who may have missed seeing his. I really tried to keep the facts straight, but - as JSL would probably tell you - info on the subject is not that prevalent. 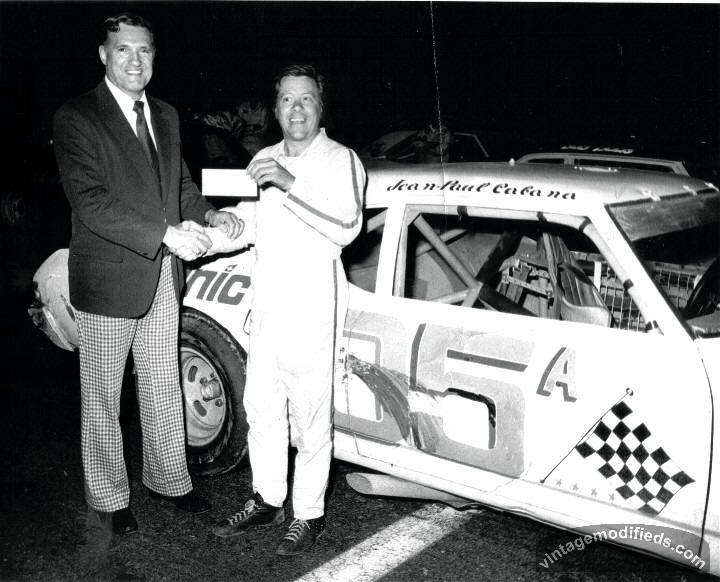 The idea of the Governor's Cup race was snatched up by the fertile promotional mind of Ken Squier, for the betterment, at that time, of his Thunder Road International Speedbowl in Barre, Vermont, conveniently near to Montpelier, the Vermont state capital. The first Cup race seems to have been in 1961, a year after Squiers and his partners, the Cooley brothers, opened the track [which was state of the art for that time]. It was far from unique to Vermont. The Unity Raceway in Maine had the idea as far back as the 1950's. Florida had a very high – profile Governor's Cup series starting in 1965. Many different kinds of organizations in various forms of racing have used this idea for a trophy. But, here in Vermont, it was certainly just as revered an accomplishment as anywhere else that was larger. The first Governor's Cup winner was appropriately a Vermonter named Mike Osborne, from Barre, whose car bore the unusual number of 1240 [a tribute, as St. Louis puts it, to the car's sponsor – WSKI – a probably now – defunct radio station. The Cup race would go on to years of ups and downs, much like the life of its first winner. 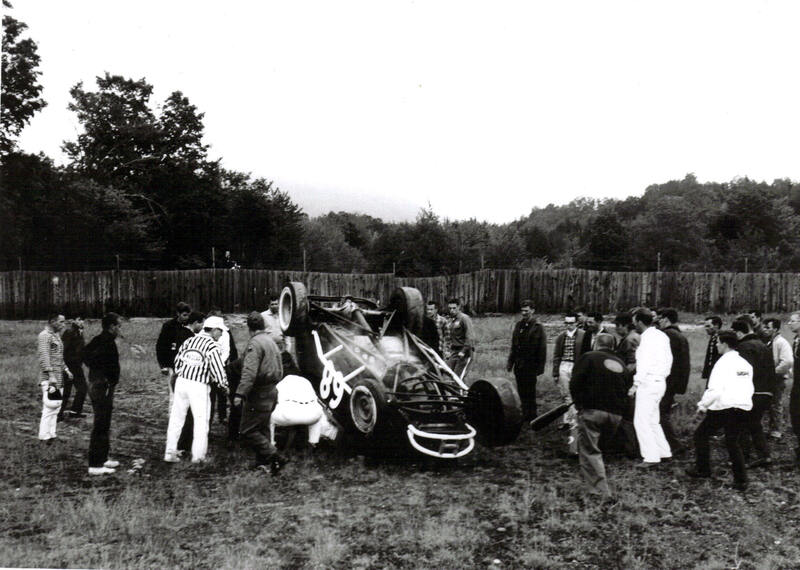 At one of those first Governor's Cup races, then – Governor F. Ray Keyser, a Chelsea native, was seen staring in amazement at the wrecked Couillard 75 car in the pit area. Governor F. Ray Keyser seems amazed at the wreckage on the Couillard 75 at the first Governor's Cup race at Barre in 1961. He would preside at two more events. Below- the first Cup champ, Mike Osborne. Thunder Road would go on to host the next three Governor's Cups, with Groveton, NH's Freddie Mills, Plymouth NH's Harold “Hardluck” Hanaford, and Barre's Tony Colicchio winning the races. Early into this string of races, Democrat Phil Hoff [who had swept into power as Vermont's first Democratic governor in eons] had come in in the wave of John F. Kennedy mania. It is hard to believe, for younger people, what a rarity a Democrat in office was in those days in Vermont. 1965 was a hugely pivotal year in the land of the Governor's Cup. Catamount Stadium had been built and both it and T Road were now under the NASCAR sanction. The Cup was recorded in some annals as not occurring in 1965. 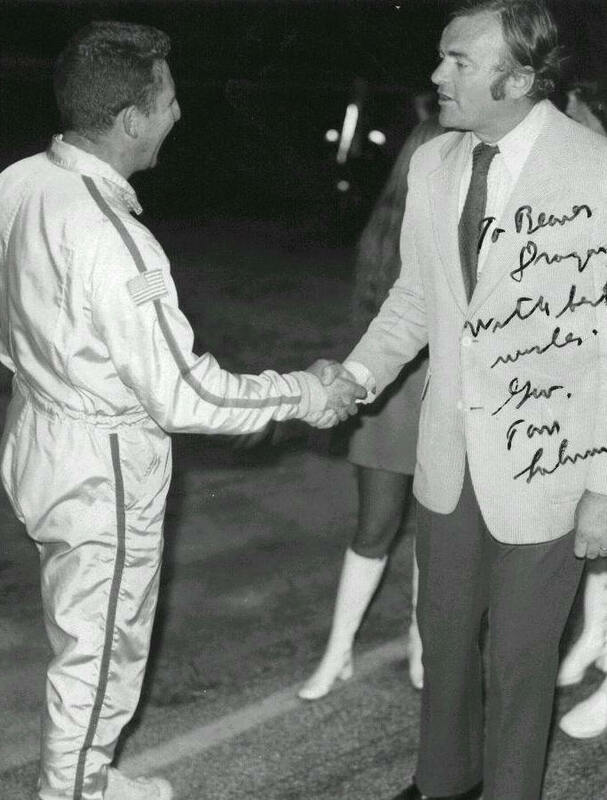 In 1966, Rene Charland, in the midst of his reign as NASCAR National Sportman Champion, won the Governor's Cup race. This was no small satisfaction after da Champ had flipped the George Hay #68 at Thunder Road two years before in a Governor's Cup event. The Cup remained at Catamount through 1968. Andre Manny won it in 1967 and the legendary Bugs Stevens took the trophy in 1968. A race which the Governor attended would also be held for the Flying Tiger division and Art Taylor of Swanton, VT was the winner in 1968. 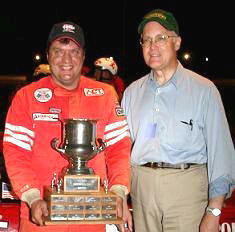 He is seen with Governor Phil Hoff at race's end; however, the traditional Governor's Cup trophy was not seen in the photo. Gov. Phil Hoff presents a trophy to winning Tiger driver Art Taylor. Below- Charland's T Road ride on its roof in 1964 during the Milk Bowl. The Road was never very kind to Charland. From 1969 to 1972, the Cup race was only run once – 1971 – at Thunder Road. Jean – Paul Cabana, who had a clear advantage in late model experience over most of the locals at that time, won. This was during the term of the highly – Conservative Dean Davis, who lent little support to the event. Cabana was awarded his spoils by Milton's Town representative Carroll Towne. The event would enjoy a revival in the term of Vermont's next top official. 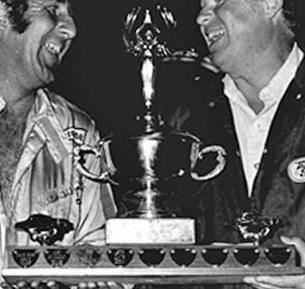 Carroll Towne hands Governor's Cup winner Jean – Paul Cabana with the winner's check at Thunder Road in 1971. This was probably orchestrated by Towne friends, the Dragon brothers. Below – Tom Salmon with Beaver Dragon. 1973 to 1976 was in the administration of Democrat Tom Salmon from Rockingham. He awarded the Cup to [in order] Dave Dion, Joey Kourafas, Bob Dragon, and Dion again. The 1974 win for Kourafas was no shocker. He had one at least one track championship, as well as the inaugural Oxford 250 and numerous features with Bob Curtiss' potent Chevelle which had come up to the circuit out of Norwood Arena. Ironically, th only photo of Salmon at a race I have is with Beaver Dragon, arguably the man who most desired and cheished winning a Cup and had not – to that date. His brother would win that evening. Inexplicably, the Cup race was not run in 1978. Wealthy Shelburne industrialist Richard Snelling a Republican was the next Governor. 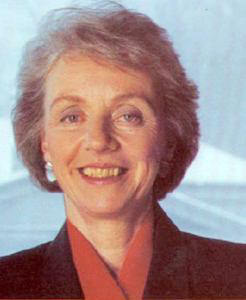 Despite the GOP's somewhat sketchy record with supporting the race, Snelling was one of its most faithful backers. He was delighted to award the 1979 trophy to a relieved and delighted Beaver Dragon. Beaver and Snelling are seen in a very friendly conversation in their photo; Beaver allowed to me that he was saying to Snelling he thought maybe he'd never get the Cup by then. Man, Governor, I never thought I'd see this day ! Snelling's list of awardees included Robbie Crouch, Stub Fadden, Steve Poulin, Jamie Aube, Crouch again, Bob Dragon, and Crouch two more times in a row. He awarded these mostly at Catamount Stadium until its closure after the 1987 season, in which the race was run by the new ACT organization with those strange, new plastic body cars. The following year, for whatever reason, the Governor's Cup was a “New Flying Tiger” race, which was one by Groton, Vermont's Jim Cilley. Then, the following year, it reverted back to late models and was won again by Dave Dion. An aristocratic European by origin, Madeleine Kunin was a pretty good sport in dealing with a form of racing most decidedly foreign to her. In her native Switzerland and in Europe, in general, racing was eagerly embraced by the upper classes; but, it was Formula One racing, not stock cars they watched. This writer recalls standing with her in the press box at Catamount, trying to explain the events unfolding below her and what it all meant. I didn't have much luck. good sport throughout it all. Below – Hollerin' Howard wasn't to have anything to do with that awful car racing bunch. Starting in 1990, Kunin's final year, the race disappeared. 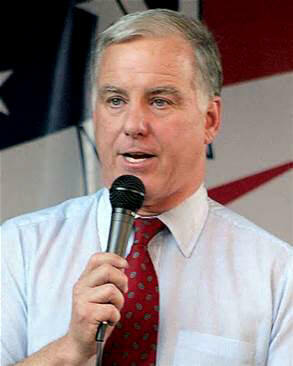 Never once was it run during the seemingly interminable reign of Howard Dean. Dean had his own agenda, and things like automobile racing, casinos, and most nay business growth were not in it. 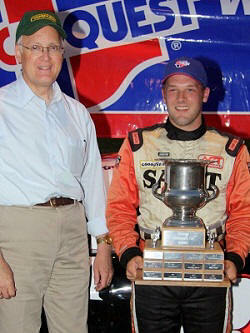 Thunder Road and the Act did flourish despite the administration; but, the Governor's Cup did not come out of hibernation until the term of mild – mannered Republican Jim Douglas – in 2005. Even as Douglas was a very good supporter of racing and the Cup, his term went two years before Tom Curley decided to dredge it up for 2005.
Cooper McRitchie, former street stocker - turned late model driver for Big Bill Lowery, took the event in its return in 2005. After MacRitchie, who soon departed from the sport, Hyde Park's tough, underfunded Eric Williams owned the Cup for two straight years. During this time, he was very adept at gathering resources to win big events – especially at the Road. Douglas would hand the Cup to Cris Michaud, Joey Polewarczyk, and Nick Sweet before retiring. Eric Williams and Gov. 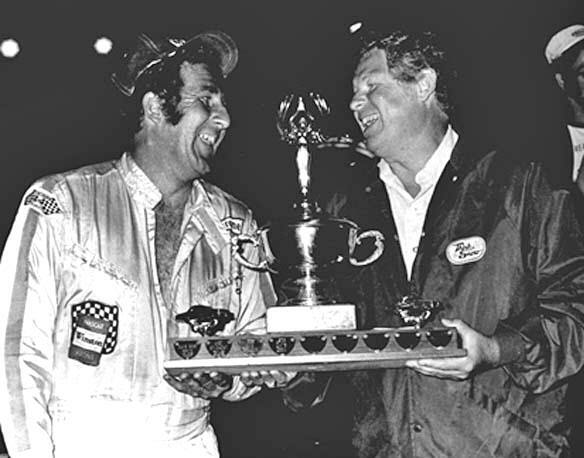 Jim Douglas got to know each other well at Thunder Road as Williams won the Governor's Cup two years in a row. Below – Nick Sweet and and a Vermont Governor Peter Shumlin have also met twice in Victory Lane: one with Douglas and the other with Peter Shumlin. The present Governor, Peter Shumlin, has made himself available for every Cup race so far in his administration. He has seen Nick Sweet win twice, along with John Donahue and the 2013 winner, Cody Blake. The Cup has seen a trend lately to be won by greater Barre area drivers, five out of the last six times. It has become the race at which there is often a guest driver such as David Ragan, Tony Stewart, or Clint Bowyer. It has survived economic downturns, negative Gubernatorial administrations, Tommie Kalomiris, a split with NASCAR, and the closure of the important Catamount Stadium. St. Louis wrote in his article: “With three-time Thunder Road champion Phil Scott becoming a prominent political figure these days, it's a likely bet that the Governor's Cup event will stick around for a while. “ More ironically, with Lt. Gov. Scott still being an important and effective Thunder Road driver, it is not out of the realm of possibility that he, as Governor, might have to crown himself champion one year, much like Napoleon crowned himself in France all those years ago. The best shot I could show of the actual cup.